NSE Nifty also shed 33.55 points, or 0.32 per cent, to 10,594.95. 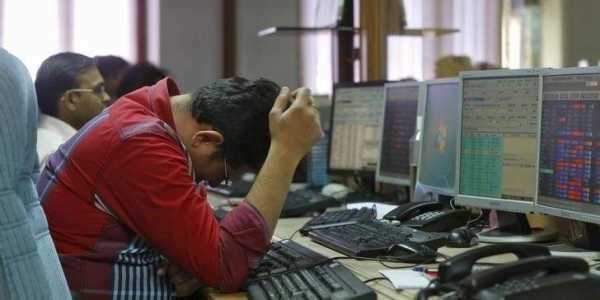 MUMBAI: The BSE benchmark Sensex slipped below the key 35,000-mark in early trade today following losses in banking, power, realty and capital goods stocks. Investors are cautious ahead of RBI's policy decision due tomorrow, brokers said. The RBI's Monetary Policy Committee began its three-day meeting yesterday amid speculation that it may hike the key interest rate for the first time in over four years on account of firming inflation. The 30-share index, which had lost 310.49 points in the previous two sessions, fell further by 101.70 points, or 0.29 per cent, to 34,910.19. Sectoral indices led by power, banking, realty, capital goods and PSU declined up to 1.20 per cent. The NSE Nifty also shed 33.55 points, or 0.32 per cent, to 10,594.95. Shares of Power Grid, Yes Bank, Bharti Airtel, Dr Reddy's, Infosys, Hero MotoCorp, L&T, HUL, Axis Bank, Bajaj Auto, HDFC Ltd and NTPC were trading in the negative zone with losses of up to 2.41 per cent. Meanwhile, domestic institutional investors (DIIs) sold shares worth a net Rs 712.41 crore, while foreign portfolio investors (FPIs) bought shares worth Rs 2,354.03 crore yesterday, as per provisional data released by the stock exchanges. Among other Asian markets, Hong Kong's Hang Seng fell 0.05 per cent, while Japan's Nikkei was up 0.12 per cent in early trade. Shanghai Composite Index also rose 0.02 per cent. The US Dow Jones Industrial Average ended 0.72 per cent higher in yesterday's trade.